Designed for Sport Sedan and Coupe drivers who demand the best out of their performance tyres. The PROXES T1R has reached a new plateau of overall performance with uncompromising tyre to road contact ensuring precise vehicle braking, ride comfort and wear resistance. 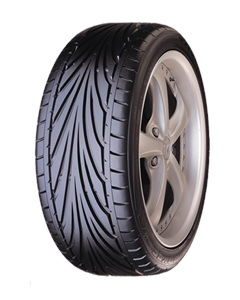 Unidirectional tread pattern provides excellent resistance to aquaplaning. New silica compound creates excellent dry handling characteristics, and minimizes heat build-up. Jointless spiral wound edge and cap ply maintain excellent high speed uniformity. Wide high-tensile steel belts provide excellent handling + high speed endurance.